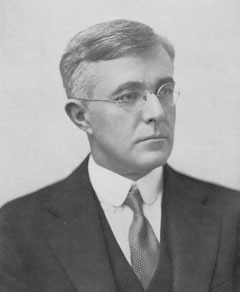 American chemist and physicist Irving Langmuir was nearly blind for the first eleven years of his life, until his vision problems were diagnosed and he was fitted with glasses at the age of 11. He soon showed a remarkable affinity for science, and as a young man he attended the University of Göttingen and studied under Walther Nernst. He taught for several years at a small college in Hoboken, New Jersey, until 1909, when he took summer work at General Electric's research labs. He quickly came to the attention of the unit's manager, who offered a permanent position at a higher wage than Langmuir's teaching job paid. In his long career at GE, Langmuir was given extraordinarily wide latitude to explore whatever intrigued him. In 1932 he became the first industrial chemist to win the Nobel Prize in Chemistry, for his 1919 concentric theory of atomic structure, detailing the chemical forces at the boundaries between different substances. His other career landmarks include the 1912 invention of the high-vacuum electron tube, later used extensively in broadcasting, and his 1913 study of the high-temperature surface chemistry of tungsten, which led to his invention of a gas-filled incandescent lamp that was much longer-lasting than previous tungsten-filament bulbs. He coined the term covalence in about 1915, a reference to the number of electron pairs an atom can share with other atoms. In 1927 he became the first scientist to use the term plasma to describe an ionized gas, and in the same year he invented a hydrogen blowtorch for welding metals at extreme high temperatures. In 1946, with Vincent Schaefer, he discovered that clouds can be seeded with dry ice and iodide to trigger a reaction producing rain or snow. He also conducted respected research into aircraft de-icing techniques, chemical bond formation, filtration, heat transfer, incandescent lamps, low-pressure phenomena, non-reflecting glass, octet atomic theory, thermionic phenomena, smokescreen generators, and submarine sonar. He is the namesake of the Langmuir isotherm (sometimes called the Langmuir adsorption equation), a mathematical expression of the relationship between gas pressure at constant temperatures and the amount of adsorption on a surface, and of Langmuir cells, long, rotating "cells" of water predicted by Langmuir many years before their actual discovery. An accomplished mountain-climber, he is also the namesake of an Alaskan peak, Mount Langmuir. He was an uncle to epidemiologist and Centers for Disease Control co-founder Alexander D. Langmuir (1910-93), and a friend and frequent flying companion of Charles Lindbergh. Kurt Vonnegut worked briefly in Langmuir's lab at GE, and years later said that Langmuir had been the inspiration for Dr Felix Hoenikker, the central character in Vonnegut's satirical science-fiction novel Cat's Cradle. About his inattention to religion, his usual response was, "Never believe anything that can't be proved."